In the summer of 2013, GEM was invited to pitch a new campaign for Albertus Magnus College. Albertus Magnus offers a variety of degree programs that fall into three main categories: a traditional undergraduate program, a graduate program, and an adult program with undergraduate and graduate degrees. Strategically-placed outdoor campaigns played a large role in drawing local interest to Albertus Magnus. With digital billboards, GEM was able to boost interest in Albertus Magnus for a wide variety of programs. New campaign designs carried over into various print assets, many of which were utilized on campus and at open house events. All campaign items matched the new branding while targeting specific groups and demographics. Using this encouraging cornerstone with an effective double-entendre, we built a multiple touch-point campaign that would boost the visibility of the College using billboard, magazine, newspaper, signage, collateral, television, radio, responsive web design, digital ads, social media and online video. In addition, we built Spanish language assets to target the Hispanic/Latino markets within the New Haven and Hartford markets. For the Spanish assets, we switched from a strong male voice to a warm female voice to reflect the matriarchal nature of Latino cultures. Using television and radio assets, we placed media on Univision, Telemundo, Radio Cumbre and La Bomba. 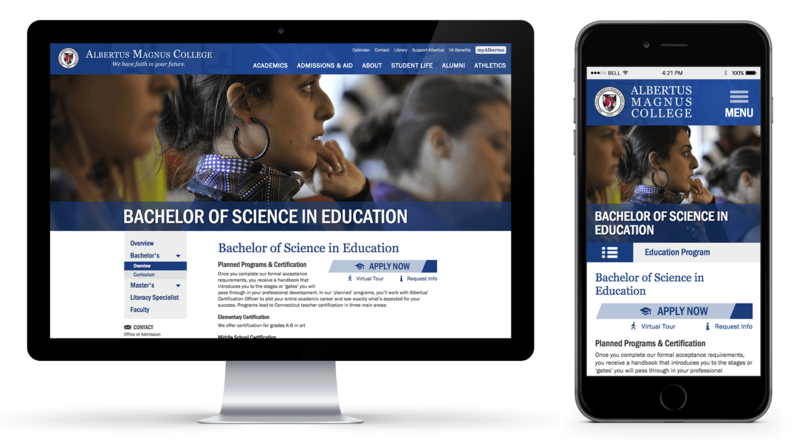 GEM was tasked with redesigning the Education degree microsite for Albertus. As of Summer 2015, this template has been adapted to their entire website. The primary KPI for the first six months of the campaign was open house attendance which ultimately led to enrollments. At the first open house, Albertus saw an attendance increase of over 700%, which led to a whopping 30% application rate. By the fifth month of the campaign, Albertus launched its first open house in its East Hartford location, which had a 40% application rate. The Campaign went on to win Davey, Telly, Communicator and W3 Awards for international excellence in writing, film+television, and integrated campaigns among colleges and universities. As metrics continue to pour in, we will update this branding story as time goes on. For now, when it comes to the growth potential at Albertus Magnus College, we have more than just faith in its future. With GEM's strong original campaign came a new way to brand TV spots and web videos. Radio spots were a crucial part of the campaign, targeting both English and Spanish-speaking people. The Albertus Magnus branding was constantly evolving to stay recognizable but fresh. Several campaigns targeting working adults and veterans ran on TV. 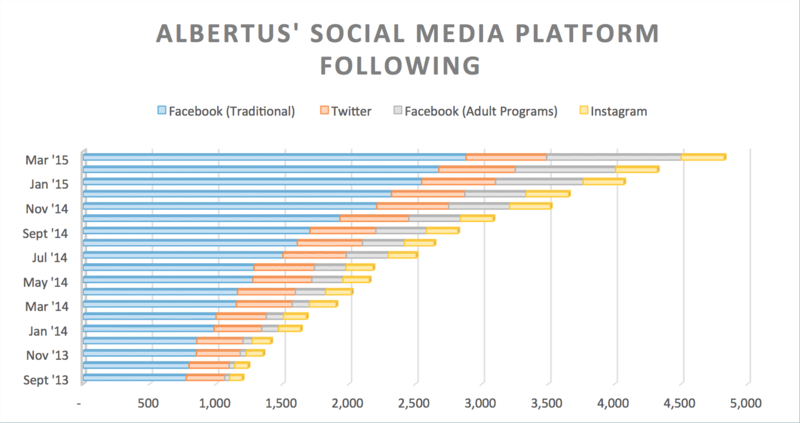 A chart detailing Albertus Magnus' social media following on Facebook, Twitter, and Instagram from September 2013 to March 2015. Click or tap to enlarge.